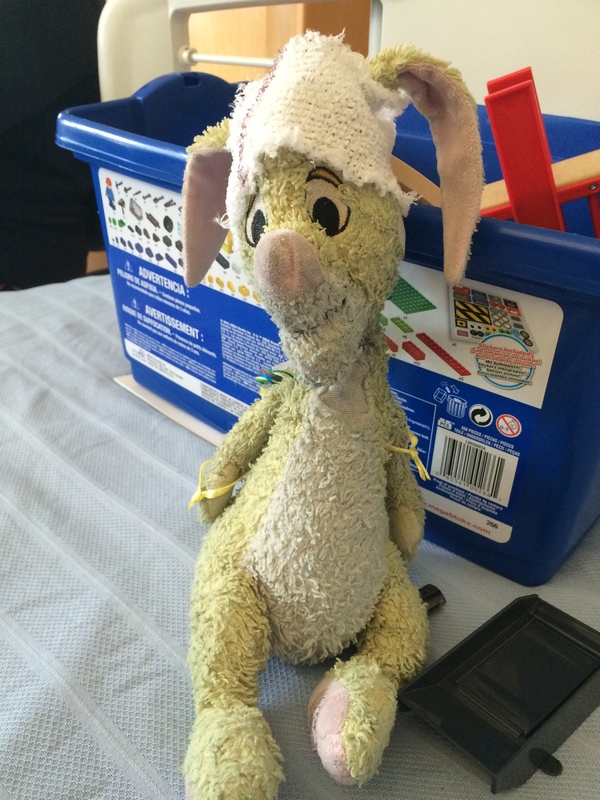 Cath Hubbuck is a Registered Hospital Play Specialist in the UK. She authored Play for Sick Children — Play Specialists in Hospitals and Beyond in 2009. After 9 years in the field, she is currently a stay-at-home mother to four small children. She keeps up her skills volunteering on the pediatric neurology ward of a large children’s hospital. Cath attended a conference presentation of mine two years ago, and has been an avid fan of loose parts since then. When she recently shared some photos of a loose parts intervention on FaceBook, I encouraged her to share the backstory of the photos. Here it is in her own words. “On one Monday morning, I visited Christopher, a seven year old boy who was due to be inpatient for five days throughout which he would be the subject of a Video EEG (VEEG). This required him to be wired up to epilepsy monitoring equipment for 24 hours a day, via a continuous video recording (and hopefully documenting an epileptic absence or seizure) and approximately 23 electrodes glued to his head, neck and chest. There were no spare wires to offer to Rabbit, unfortunately, but choosing to grab an opportunity for some child-led, play-based learning, I said that was something we could do together that morning and soon found myself in the resources cupboard wondering what “loose parts” could be used for such a task! It did not need to be anything complicated, but I did feel it needed to be as authentic in appearance as possible, yet simple to put together and something we could start straightaway before Christopher’s enthusiasm shifted and stuck on to something else. Equipped with five different colors of twisted cotton embroidery thread, a handful of HAMA (or Perler) fuse-beads, a roll of Micropore tape, scissors, card, pens and a small drawstring organza craft bag, Christopher and I set about giving Rabbit the wires he needed for the week. While I took along the parts required, the activity was largely led by Christopher, who was able to choose how many leads his rabbit would need (he chose 10, as 23 ‘seemed a lot for a rabbit’) and cut the colors of thread he wanted, after looking at the different colors of his own leads and also measuring how long they should be for his toy. It was my job to tie a fuse-bead to the end of each ‘lead’ – the color of each was carefully selected by Christopher – and we then cut a small square of tape and stuck these on to Rabbit’s head, neck and shoulder. The result was both an effective yet simple model of VEEG monitoring, but also an opportunity to talk with Christopher about the way that his VEEG monitoring would work. It also created a connection with his parents, who talked fairly freely about his diagnosis of a tumor, their anxiety about the as-yet unknown prognosis of this, and their hope that this monitoring would give them all some answers about his ‘odd episodes’ and absences. 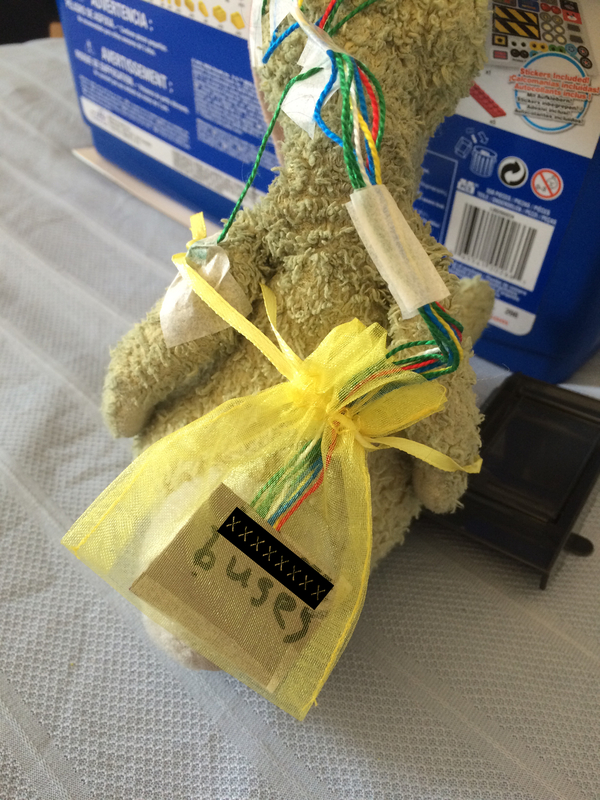 Once Rabbit had his leads attached, Christopher rightly stated that he also needed ‘a special box to plug the wires into – like mine’ – so one was carefully made and the words ‘Christopher’s Buses’ carefully written on to it. These words may not have seemed significant to his VEEG, but Christopher had already told me that the thing he liked more than anything else was buses. Therefore, no matter his reason, these words held significance for Christopher – and that is always good enough for me, requiring no question. 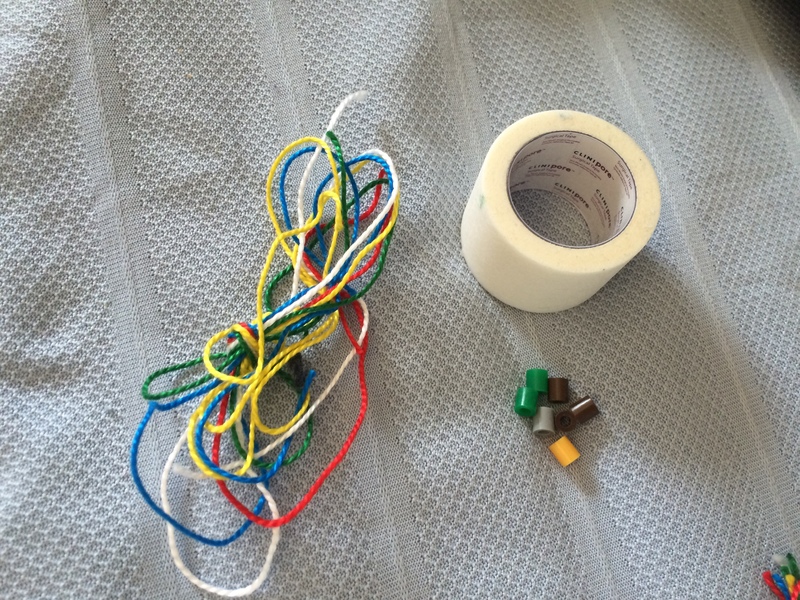 The last thing required was to bunch his wires together – something that the Neurophysiologist had done to Christopher’s leads to keep them neat and to prevent them being pulled or dislodged during his week-long stay, (this job was left to me, since it was a little bit fiddly!) – and to put them in a bag for Rabbit to wear on his back. The job was complete. Some talking had happened. 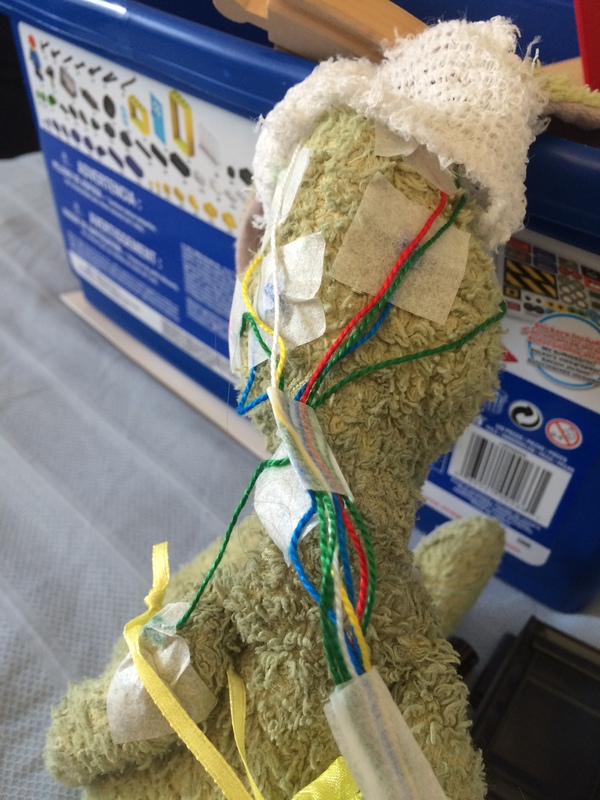 Christopher had both chosen and then led the task, playing our way through the application of EEG monitoring wires onto a much-loved toy. The simplest and most accessible of loose parts had become an effective and meaningful way to make sense of a relatively invasive, definitely restrictive and significant period of monitoring for Christopher and his parents. That is a beautiful story, and you indirectly caused it. Just wonderful.